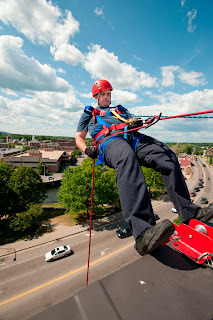 While not as epic as Joe McNally's shot of the guy changing the light bulb on the Empire State Building, it was pretty cool to photograph some of my "brothers" on the Laconia (NH) Fire Department doing high angle rescue training from the roof of one of the city's tallest buildings on Monday. I've been extremely fortunate to have been a member of the department, as their photographer, for a number of years now and have photographed and participated in many of their training sessions over the years. Monday afternoon started with a phone call from Chief Ken Erickson telling me that "the boys" were "playing" on the high rise and they had said "Alan should come and take some pictures." So I headed up to meet with the gang and was swung up onto the roof in the aerial basket. The guys are, out of necessity, consummate safety pros so everyone on the roof was "clipped in". 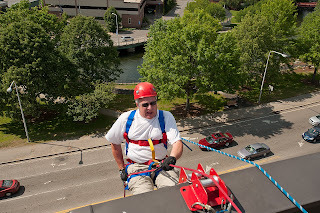 I shot a bunch of images of the guys rappelling down the seven story (yes, you city types, I know, seven stories is nothing) building. They had a bunch of fans in the building, which houses a fair share of elderly folks (like me), who were applauding as the guys made it safely to the ground. The lead guys in this exercise are Jeff Desrosiers and Steve Hanser, both experts in ropes and all the little gizmos that go along with being able to lower someone safely to the ground from what is, for some, a dizzying height. If Jeff said he could take a ball of string and make the aerial ladder fly, I'd go along with him. Jeff yelled out to me "Hey Alan, want to go?" and I said sure. Now a small disclaimer here, I've done this before, but I think a few of the new guys didn't know that, so when I said yes and started suiting up, I think they were a bit surprised. Like I said, Jeff and Steve are experts, like "Don't try this at home", at this stuff and once you're clipped in, it's amazing how secure you feel as you lean backwards out over the edge of the building, until you're parallel with the ground and then just start walking backwards down the side of the building. Way cool! As I said before, I've done this with these guys before and, I'm happy to say, some of what I learned the first time actually stuck! I don't think anyone will forget, or let me forget, the first time, on a three story building, when I stepped off the edge too early and smacked into the side of the building, camera and all. Neatly over the edge, parallel to the ground, walk backwards. Yes, it's really that simple. I told my oldest son Ryan, who is a merchant marine, about it and his answer was "F--- that!" My youngest, Kevin, who is an avid sky diver was like "Way cool, Dad!" When I had lunch with the Chief the next day, he said "Why am I not surprised?"